If you are a visitor to the "Show Me" state Missouri, plan a unique ghost-hunting adventure and stay at one of Missouri's haunted hotels. And if you are a resident of Missouri, get to know your state's spookier side and embark on an exploration of the unexplainable and visit one of Missouri's very own haunted hotels. One of its most haunted hotel is the Lemp Mansion Inn in St. Louis - it is known to be one of the ten most haunted places in America! 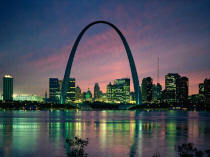 Missouri, "show me" and your guests the ghosts. 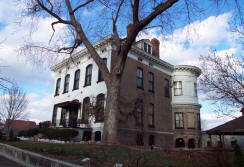 The lovely The Lemp Mansion in St. Louis is said to be one of the ten most haunted places in America. It has been featured in numerous articles and television shows dealing with the supernatural. In its lifetime, the mansion has been a stately home of millionaires, office space, a boarding house, and now restored as a beautiful bed and breakfast offering dinner theatre and a restaurant. Today they have a ball with their haunted stature – from throwing festive Halloween parties, hosting murder mystery dinners to leading Lemp haunted history tours every Monday evening. 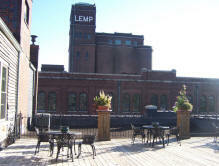 It is believed that the Lemp Mansion became haunted due to the tragic history of the hotel’s namesake, the Lemp family. The Lemp family (led by patriarch William Lemp) operated the Lemp Brewery which covered ten city blocks and was the largest brewery in St. Louis until Prohibition. The first major tragedy in the Lemp family occurred when Frederick Lemp, William's favorite son and his heir to the brewery, died mysteriously in 1901. Grief-stricken, William shot himself in the head in a bedroom of the Lemp Mansion three years later. Unfortunately, the Lemp family continued their tragic turn, including four suicides. There have been numerous reports from people citing unusual experiences in the mansion, especially at the time when the hotel was being restored in the 1970’s. A painter hired to restore the ceilings was alone in the house when he experienced the uncomfortable feeling of being watched. When he heard his name called, he quickly ran from of the mansion. One morning a waitress arrived before ghastly_tales_for_adults.htm else and saw a man sitting at one of her tables. When she approached him, he vanished into thin air! Glasses may lift off the bar and fly in the air. Sounds are heard with no explanation behind them. Doors lock and unlock on their own. The piano in the bar plays on its own. Some people have even caught a glimpse of the resident ghost, the "Lavender Lady." 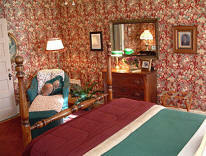 The Walnut Street Inn is a cozy little Queen Anne Victorian bed and breakfast offering twelve charming rooms for its guests. 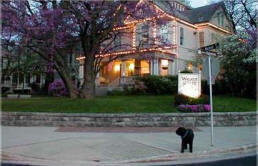 The Walnut Street Inn was built by Charles McCann in the mid-1890s and was originally called the McCann-Jewell House. Tucked away in Springfield Missouri, you won’t find Homer, Marge or Bart here, but you might find a ghost. There have been some reports of ghostly activity coming from one of its rooms, the Rosen Room – named after the fourth owners of the home. One such case involved a male guest in 1998. He reported that while he was lying on the bed, he suddenly noticed a woman sitting at a table against the wall (left). He must have thought she was a real-live person because he said to her , “Excuse me, this is my room.” The ghost looked at him and simply replied, “No, this is my room.” And then she vanished. Upon hearing this guest’s story, the staff tried to contact this woman using a Ouija board. They soon learned that the woman had died in her 70s and stayed on to watch over the house. However, they did not get a name. Perhaps she had once lived there and died in the Rosen Room. We may never know for sure. We have learned that some ghost hunters did not find any paranormal activity there when they visited. Perhaps the ghost lady was busy somewhere else at the time.